The expression immediately lept to mind yesterday when I read that Carlos Ghosn, the man credited with saving Nissan, had been arrested for allegedly using company money for personal expenses. The phrase, however, is not always true in Japan. There are numerous examples of individuals who have stuck out, survived, and flourished. For much of his career, Ghosn was one of them. Based on a whistleblower report, Nissan Motor Co., Ltd. (Nissan) has been conducting an internal investigation over the past several months regarding misconduct involving the company’s Representative Director and Chairman Carlos Ghosn and Representative Director Greg Kelly. The investigation showed that over many years both Ghosn and Kelly have been reporting compensation amounts in the Tokyo Stock Exchange securities report that were less than the actual amount, in order to reduce the disclosed amount of Carlos Ghosn’s compensation. Also, in regards to Ghosn, numerous other significant acts of misconduct have been uncovered, such as personal use of company assets, and Kelly’s deep involvement has also been confirmed. Japanese Nissan employees interviewed by ANN News said they were shocked to hear of the arrest. As CNN reports, Ghosn has yet to respond to the allegations. 2001 was the same year I moved to Japan. I remember hearing stories of people who worked at Nissan dealerships quitting because they were unhappy that Renault had taken over. Anecdotal, I know. Jake Adelstein at The Daily Beast suggests that the foreign nationality Nissan’s Chairman might have played a part in this recent crackdown. Perhaps, but for me, the arrest brought back memories of Japanese businessman Takafumi Horie, who was arrested and sent to jail for securities fraud. Horie, who was nicknamed “Horiemon” due to his resemblance to the anime character Doraemon, was loud, brash and unconventional. He criticized Japanese business culture, challenging its formalities, decorum and stagnation. In 2005, I interviewed Horie when he was at the height of his fame. Months after the interview, he was running for political office. The bid came in the wake of his attempted hostile takeover of a popular Japanese TV network. He lost the election and within months, he was arrested for financial crimes. 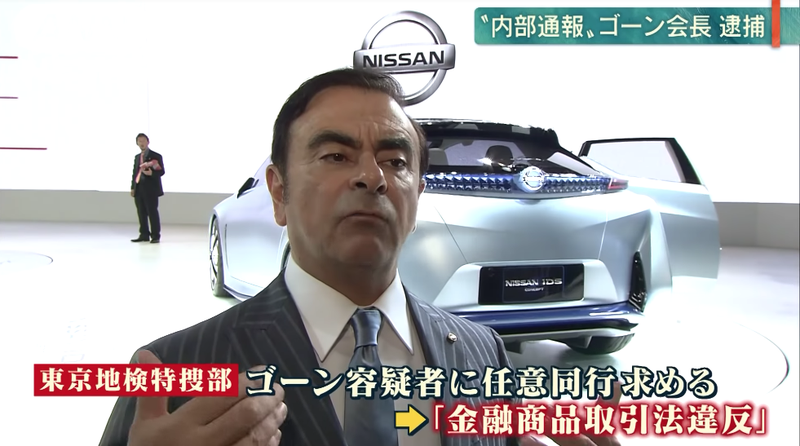 Ghosn wasn’t nearly as combative, vocal or brash as Horiemon. By international CEO standards, his public persona was not that unusual or eccentric. In Japan, most company execs are often boring—though, there have been exceptions. However, there were also incidents that caused Ghosn to stand out in dull corporate Japan. In 2004, for example, Ghosn was in a minor car accident while driving a Porsche. The reaction at the time from TV pundits was one of surprise. Why wasn’t he driving a Nissan? Or, at least, a Renault? Why a Porsche? It seemed like a betrayal. Then there was the money. There was always the money. For the rest of this tenure as CEO, Ghosn’s salary was continually a subject of conversation. In 2010, he became the highest paid CEO of any Japanese company (well, among those that disclose corporate salaries). Five years later, it was announced that he was the first Japanese company exec to get paid over a billion yen (then $8 million) salary. In comparison, the CEO of Ford earned $22 million. However, even among Japan’s wealthy execs, there has long been a practice of lower salaries in comparison to their international counterparts. Bloomberg reported that Ghosn made five times what Toyota president Akio Toyoda did in 2012 even though Nissan made only a third the profit. However, Toyoda made closer to Ghosn’s salary once dividends were taken into account. But during years Toyota struggled or was faced with, for example, safety issues, it would cut corporate pay while Nissan’s top exec continued to defend his pay. It’s been said that the reason why Japanese CEOs make less money than brass in other countries is that they do not want to attract attention. In Japan, what often matters is the appearance, how something looks and how it stands out. And Ghosn certainly did that.